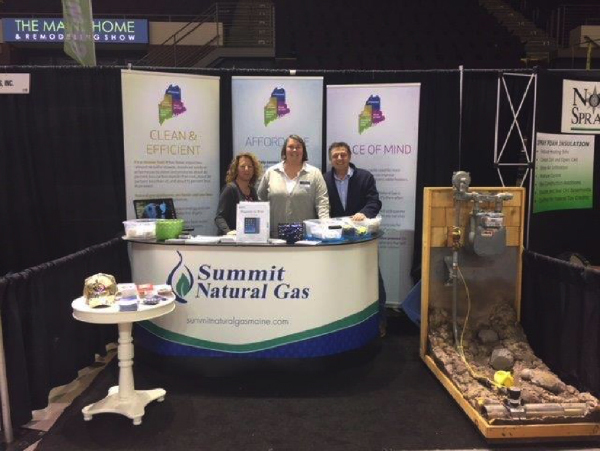 SummitattheMaineHomeShow - Summit Utilities Inc.
Erika Bennett, Anne Johnson, Arthur Woolverton, and Rick Bellemare of Summit Natural Gas of Maine participated in the Maine Home Show recently held in Portland on Feb. 10th. Over 150 groups from throughout the state exhibited at the show, which drew thousands of residents and business owners from Maine to Massachusetts. As a result, Summit was able to have engaging discussions with both current and future customers. Rick Bellemare was able to assist the sales department by answering questions on construction processes, gas safety, cross boring, and 811 topics.